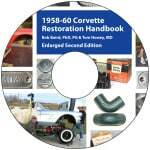 1958-60 CORVETTE RESTORATION HANDBOOK ENLARGED and EXPANDED SECOND EDITION, by Bob Baird, PhD & Tom Howey, MD. Two-column spiral bound paper version that opens and lays flat on your fender for easy reference while you work. What you thought was an already big Handbook is now even bigger with more explanation and color photos than ever! 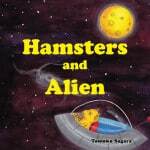 Includes the results of an additional seven years of research since the First Edition. 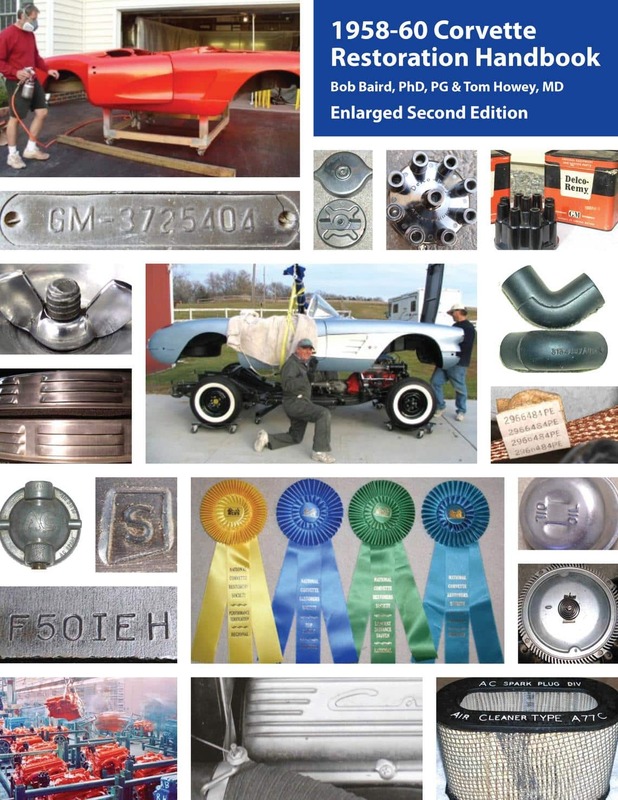 Over 300 pages and over 1,300 detailed full-color photos and diagrams, many of original parts and from Bowtie and unrestored cars and period factory photographs. The 1958-60 Corvette Restoration Handbook obviously concentrates on 1958-60 Corvettes but, of necessity, covers many aspects of relevance to 1956-57 and 1961-62 Corvettes, as well, because of the carryover in identical parts. The Handbook covers all aspects of a full body-off restoration from start to finish including: • How to buy a Corvette • NCRS/Corvette Terminology • Painting and Blackout Sequences – What’s On, What’s Painted, What’s Not • Tech Tips and How To Make Repro Parts Correct • All the Things that the Judges are Looking For • A Must-Have to Pass PV! • Use to identify features and parts that are not typically judged on Corvettes claimed to be original • Also available on CD for your computer in an easily searchable format and so that you can enlarge the photographs even more for closer study of the various aspects of the Corvette and its parts. Bob and Tom are Red Hat Master Judges who have done complete body-off restorations themselves and have taken their 60 and 59 to the Duntov level. They are frequent contributors to the NCRS Restorer.